Another month for workshops and retreats of a non Quantum Life Bodyworks nature. 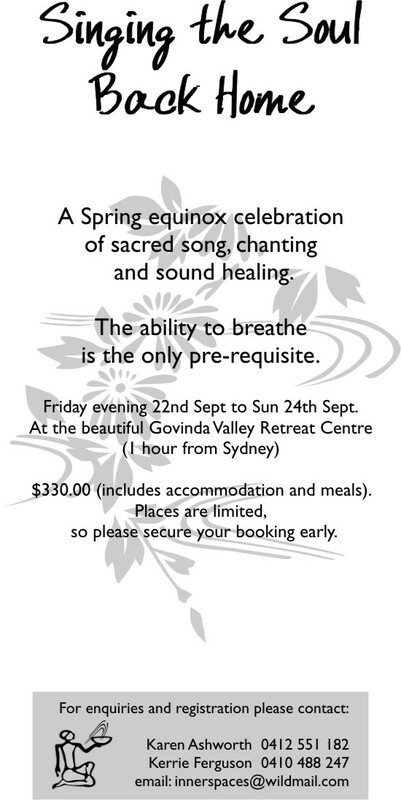 A reminder that registrations for Singing the Soul Back Home retreat will shortly be closing, please contact Kerrie or Karen directly if you wish to spend the weekend in song with them at the beautiful Govinda Valley Retreat centre. Gwynne Jones will again be offering teachings of culinary delights as medicine in her Celebrate Spring workshop. Details may be perused in the document available here. Additionally Gwynne will be offering a 6 week course Play With Gravity at The Breathing Space yoga studio in Avalon, beginning Saturday October 21. Details are available here. Finally a reminder that I will be available for individual consultations in Avalon from 27th until 30th September. As ever Kerrie will arrange bookings and can be reached on 0410 488 247. Why not speak to her about Singing the Soul Back Home! A topic that I have oft discussed these last months has been the need for community participation in medicine. On the whole we have been conditioned to imagine ourselves unable to participate in the makings of health, confronted by a monolithic, paternal and bureaucratic mechanism which cares more for management than care. I say this not to detract from the exceptional work done by many individuals in the hospital and healthcare system, but in recognition that something is fundamentally wrong with the health of the community. The reductive, statistical, management and control model is floundering in the face of antibiotic resistant bacteria, mutated disease forms, potential pandemics and excessive resource use compounded by lack of funding. By actively participating in healthcare, which is to say creation of health at an individual and community level we empower ourselves and reduce dependance upon crisis care and symptomatic relief. Health means considerably more than a lack of symptoms, and food, song and dance/movement are integral components of a healthy life. I encourage you to support those who are looking to redress some of the imbalance in modern lifestyle by bringing to being intentional gatherings to heal the imbalances in modern lifestyles. Daily we are bombarded with information pertaining to the collapse of our ecosystems, our economies, our governments and our families. Much of this information is false, or at least heavily embellished to serve the agendas of vested interests. What better way to redress the imbalance of these onslaughts than to create economies at a community level which support health, harmony and beauty, nurture life and promulgate Love.